While JSON or SOAP-wrapped messages are ubiquitous in HTTP-based APIs, there are times when unformatted messages are of advantage. 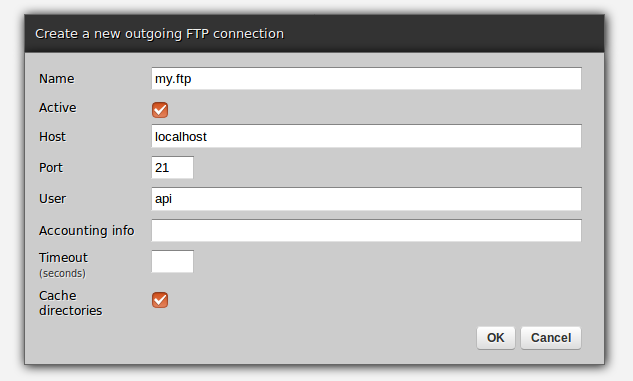 This article will explain how to create Zato endpoints accessing such data and to top it off, will also introduce the concept of outgoing FTP connections through which requests can be stored at remote FTP resources. Hot-deploy the following service onto a Zato cluster. The key point is self.request.raw_request - this is how a programmer can access input data as it was received by Zato prior to its de-serialization from JSON or XML. Note that this attribute will be available even if parsing took place, that is, one can always access raw request no matter what data format was used on input. pointed to by an outgoing connection called 'my.ftp'. # i.e. no colons or whitespace. Now that the code is deployed, we need configuration to plug it into the whole framework. Use web-admin to create two objects per screenshots below. One is an HTTP channel that exposes the deployed service through an HTTP channel - note that 'Data format' was left blank so as not to require JSON or XML on input. The other is a definition of the FTP server that the service will store files in. 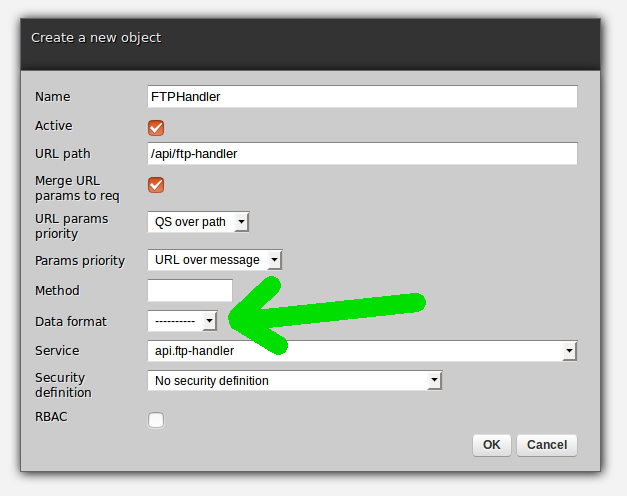 Don't forget to set password for the newly configured FTP connection to log in with in run-time. As always with Zato, one's code never accesses any resources directly, everything is routed through named objects such as self.outgoing.ftp['my.ftp'] that actually point to a required resource. In this manner, if anything needs to be reconfigured, it can be done on fly, without changes to code and without server restarts. With code deployed and configuration created, we can now upload sample data from command line and confirm it's made its way to an FTP server. And sure enough - the file is there! Accessing raw requests in Zato services is trivially easy. Likewise, making use of FTP connections is a matter of a single line of code, while hot-deployment and configuration mean that changes introduced in web-admin are immediately reflected all throughout a Zato cluster. 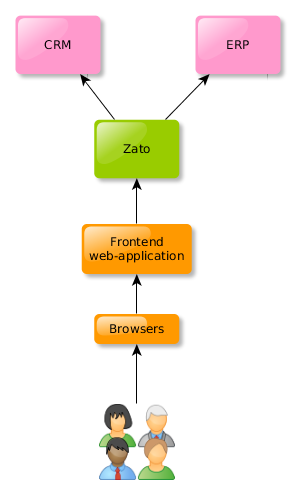 One of fundamental principles of programming with Zato is that one's services are typically insulated from inner workings of underlying data formats or security schemes - after all, why bother with mundane tasks such as authentication or authorization, it should be the platform's job whereas user services should rather focus on their own job. Conversely, once a security definition is created in web-admin, it can be applied in multiple places without requiring any changes to Python code. 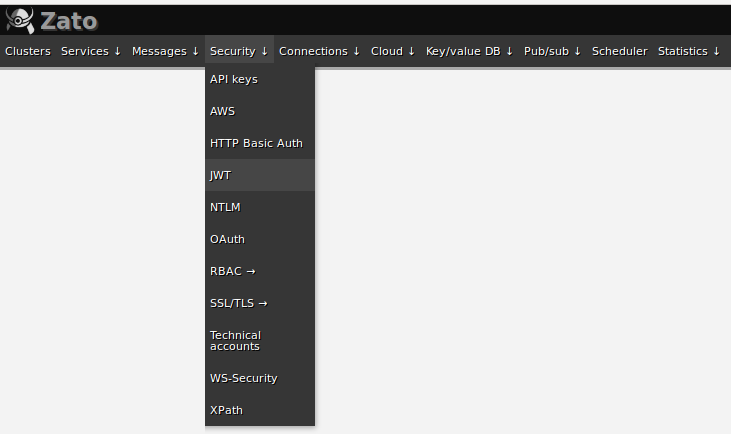 All of that applies to a newly added feature of Zato that lets one keep API secrets in Vault and this blog post introduces key concepts behind it. 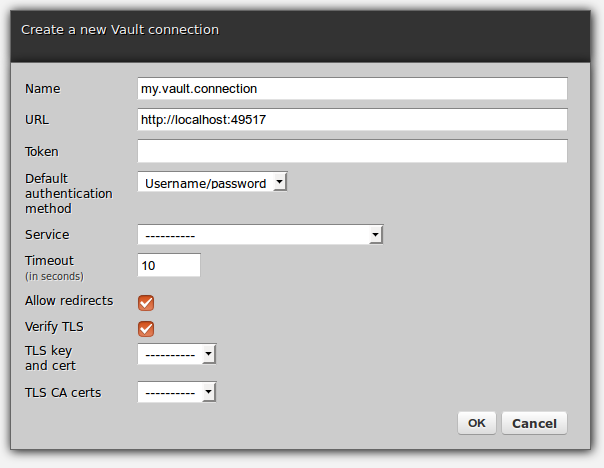 Vault is a dedicated tool to store and make use of secrets that offers support for common authentication and authorization related workflows, such as secure storage and broad or fine-grained secrets management as well as policies describing what action a given holder of a secret can perform. The system is open to customizations and makes for a great companion to Zato in letting one easily express who can access what, for how long, and under what conditions. Vault needs to be installed separately to Zato. This post assumes that there is a Vault instance running on http://localhost:49517, already unsealed, using the configuration as below. Essentially, this is a development server but unlike the Vault's default dev server, this one keeps data on disk instead of RAM. The easiest way to create a new connection is through web-admin, simply fill out the form as below and a new connection to Vault will be created. Default authentication method - which authentication backend to use default to authenticate requests, can be Token, Username/password or GitHub. LDAP is coming up soon. Service - a service that can be invoked if no default method was defined - the service can extract credentials from request and indicate what method to use. TLS options - whether TLS connections should be verified and if so, using what CA certs unless default ones should be employed. Also, an optional client TLS key and certificate can be uploaded so that Zato itself authenticates with Vault using this key/cert pair. 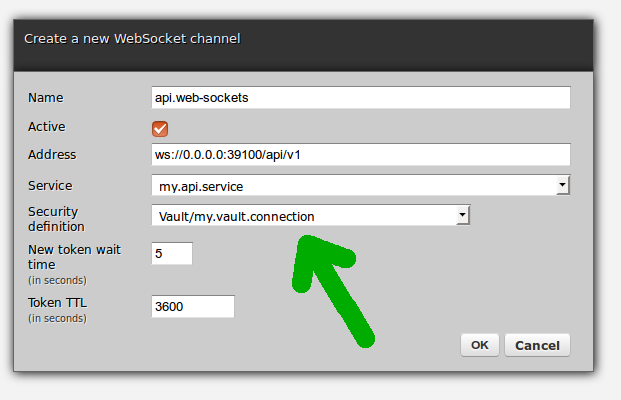 Authentication with Vault works with regular HTTP REST or SOAP channels as well as with WebSockets - pick the newly created Vault connection from the list, click OK, and this is it, your channels will now be secured by Vault. If you have already existing channels, you can swap out their current security definitions for Vault-based ones and things will just work without server restarts. The above is everything that is needed to define API endpoints backed by Vault which will now on behalf of Zato authenticate users according to what was provided on input when invoking a service. 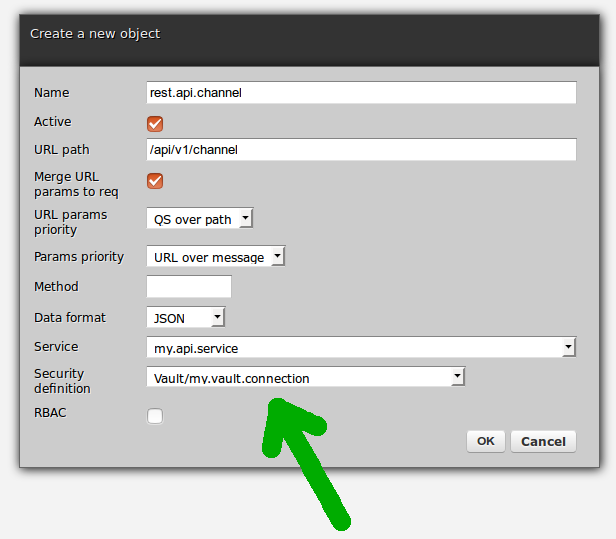 However, a complementary aspect is that of authorization - i.e., assuming that in the incoming request there were valid credentials and the service can be invoked at all, we can do one better, go a step further, and define Vault policies to express business relations between objects exchanged in API calls. This will let one store rules in a central place accessible to any API endpoint. 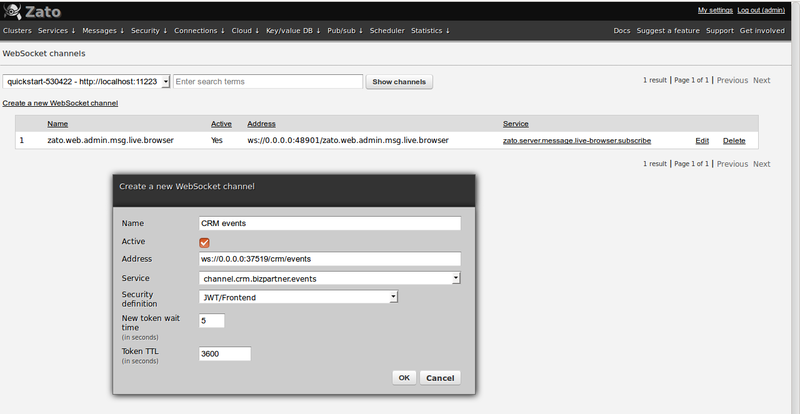 This part of the Zato-Vault interface is still under active development - watch this space for more information! 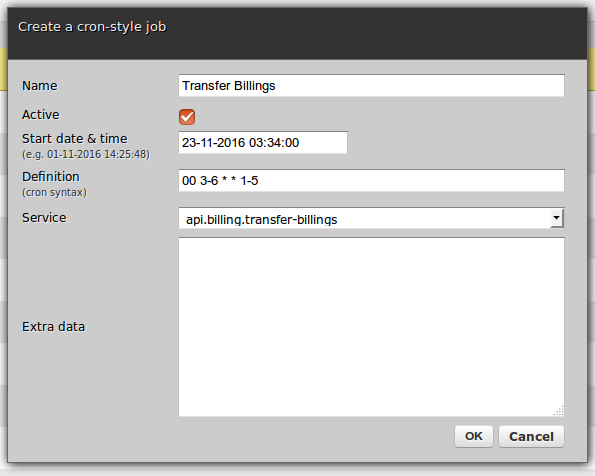 This blog post introduces the Zato scheduler - a feature of Zato that lets one configure API services and background jobs to be run at selected intervals and according to specified execution plans without any programming needed. Future posts will introduce all the details whereas this one gently describes major features - overall architecture, one-time jobs, interval-based jobs, cron-style jobs and public API to manage jobs from custom tools. 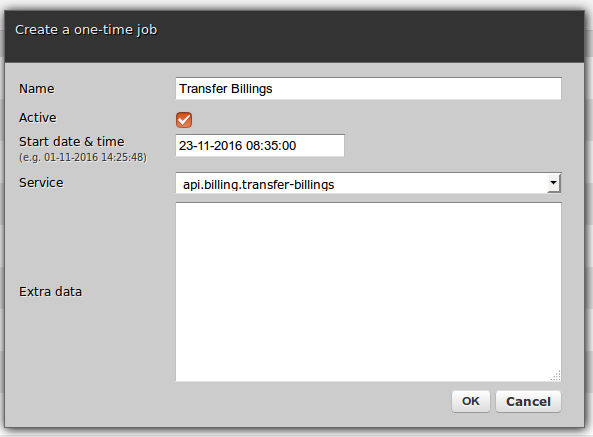 In Zato, scheduler jobs are one of channels that a service can be invoked from - that is, the same service can be mounted on a REST, SOAP, AMQP, ZeroMQ or any other channel in addition to being triggered from the scheduler. No changes in code are required to achieve it. # .. and send it to its recipient. Nowhere in the service is any reference embedded as to how it will be invoked and this is the crucial part of Zato design - services only focus on doing their jobs not on how to make themselves available from one channel or another. Thus, even if a service to bulk transfer billings initially will likely be invoked from the scheduler only, there is nothing preventing it from being triggered by a REST call or from command line as needed. Or perhaps a message sent to an AMQP should trigger it - that is fine as well and the service will not need be changed to accomodate it. 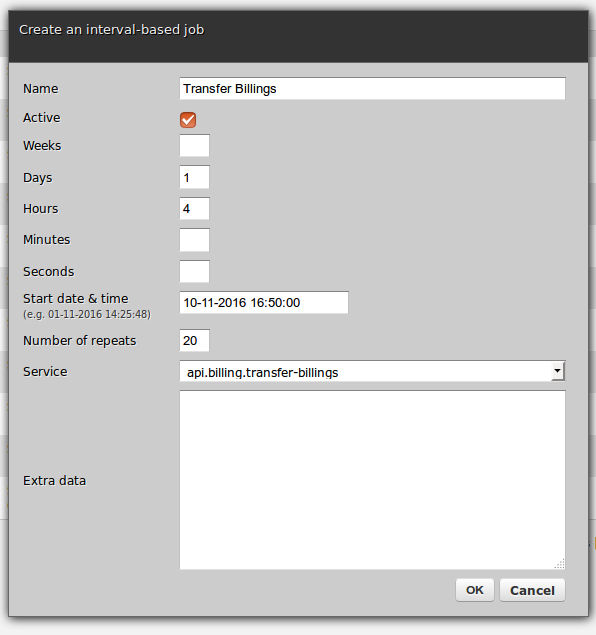 interval-based jobs - let one specify how often to invoke a given service (e.g. once in four weeks, twice an hour, five times a minute) as well as when to stop it so as form complex plans such as 'After two weeks from now, invoke this service twice an hour but do it twelve times only'. Note that job definitions always survive cluster restarts - this means that if you fully shut down a whole cluster of Zato servers then all jobs will continue to execute once the server is back. However, any jobs missed during the downtime will not be re-scheduled. When a job is being triggered, its target service can receive extra data that may be possibly needed for that service to perform its tasks - this data is completely opaque to Zato and can be in any format, JSON, XML, YAML, plain text, anything. If a job should not be scheduled anymore - be it because it was a one-time job or because it reached its execution limit, it becomes inactive rather than being deleted. Such an inactive job still is available in web-admin and can be made active again, possibly with a different schedule plan. On the other hand, actually deleting a job deletes it permanently. This was just the first installment that introduced core concepts behind the Zato scheduler - coming up are details of how to work with each kind of the jobs, their API and how to efficiently manage their definitions in source code repositories. In a recent project, an interesting situation occurred that let JSON Web Tokens (JWT) and WebSockets, two newly added features of Zato middleware server, be nicely employed in practice with great results. The starting point was the architecture as below. Pretty common stuff - users authenticate with a frontend web-application serving pages to browsers and at the same time communicating with Zato middleware which provides a unified interface to further backend systems. Now, the scenario started to look intriguing when at one point a business requirement meant that in technical terms it was decided that WebSocket connections be employed so that browsers could be swiftly notified of events taking place in backend systems. WebSockets are straight-forward, come with all modern browsers, and recently Zato grew means to mount services on WebSocket channels - this in addition to REST, SOAP, ZeroMQ, AMQP, WebSphere MQ, scheduler, and all the other already existing channels. However, when it came to implementation it turned out that the frontend web-application is incapable to act as a client of Zato services exposed via WebSockets. That is, it could offer WebSockets to browsers but would not be able itself to establish long-running WebSocket connections to Zato - it had been simply designed to work in a strict request-reply fashion and WebSockets were out of its reach. This meant that it was not possible for Zato to notify the frontend application of new events without the frontend constantly polling for them which beat the purpose of employing WebSockets in the first place. Thus, seeing as browsers themselves support WebSockets very well, it was agreed that there is no choice but have each user browser connect to Zato directly and WebSocket channels in Zato would ensure that browsers receive notification as they happen in backend systems. Deciding that browsers connect directly to Zato posed a new challenge, however. Whereas previously users authenticated with the frontend that had its own application-level credentials in Zato, now browsers connecting directly to Zato would also have to authenticate. Naturally, it was ruled out that suddenly users would be burdened with a new username/password to enter anywhere. At the same time it was not desirable to embed the credentials in HTML served to browsers because that would have to be done in clear text. 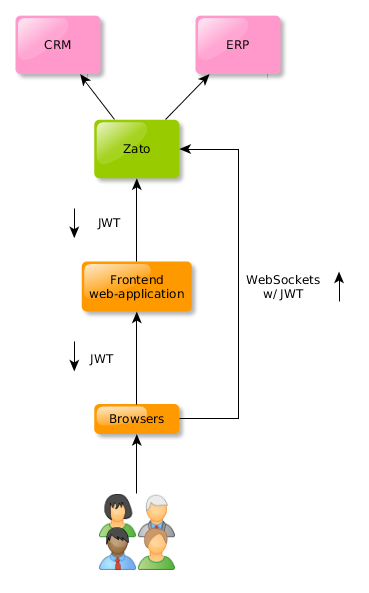 Instead, JWT was used by the frontend application to securely establish a session in Zato and transfer its ownership to a browser. In other words, JWT declares that a username/password combination was valid at a certain time and that this particular token was generated for that user and that it will be valid until it expires or is further prolonged. Having all the pieces in one place meant the solution was simple - it was the frontend application that would call a custom endpoint in Zato to create a JWT for use in browsers. Since the token is safely encrypted, it can be passed around anywhere and Zato can return it to frontend without any worries. Once the frontend returns the token to a browser, the browser can then go ahead and open a direct WebSocket connection secured with the newly generated token. 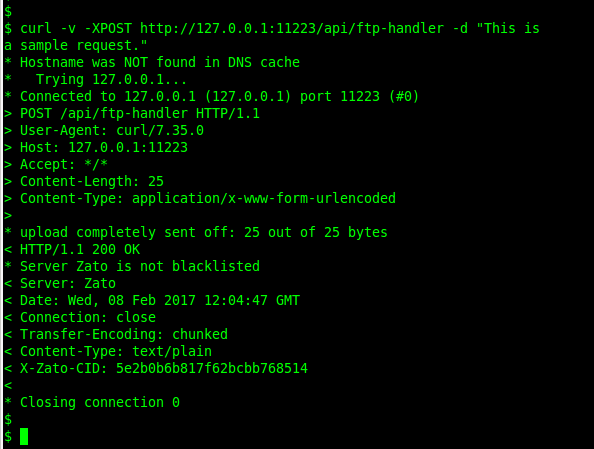 Zato receives the token, decrypts it and confirms that it is valid and was in fact generated on server side as expected. The net result is that browsers now have secure direct WebSocket connections to Zato yet no user credentials are relayed anywhere in clear text. At the same time, users started to receive notifications from backend systems and everyone was excited even though initially the situation looked bleak when it turned out that the frontend couldn't itself become a WebSockets client. 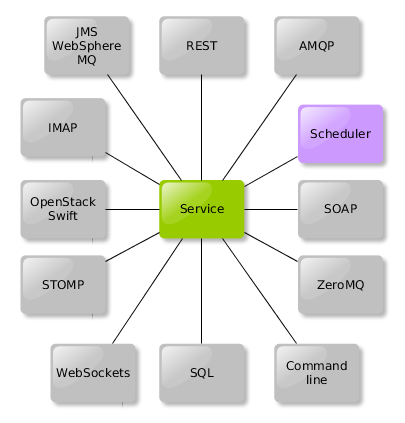 While it is not very common to connect one's Zato environments to dozens of different AMQP or JMS WebSphere MQ queue managers at a time, one can frequently have dozens or hundreds of services or REST channels declared in a given cluster.